Thoughts That Go Bump in the Night: Damn Bing Crosby! No, that’s not my sentiment. 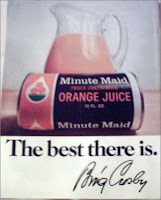 But apparently, it was the sentiment of a fellow forty years ago when the late crooner was endorsing Minute Maid Orange Juice. As was explained to me, the fellow was incensed that Crosby got money every time someone bought the frozen juice and, according to the fellow, Crosby had more than enough money and didn’t deserve any more. And, by Golly, the fellow wasn’t going to give up his hard earned money to Bing Crosby! So, the family did not buy orange juice. So, there! Take that, rich man! I don’t think I’m exaggerating. There’s a reason envy is among the infamous seven dead ly sins plaguing mankind. When active, envy prevents prosperity. Prosperity is that state of abundance, whether financial, health, peace of mind, and so on. As with any focus of attention, the more envious a person, the greater the envy (which is not a comfortable emotion.) The negative feelings associated with envy can become stronger and push away other elements in the person’s life until it dominates. The Law of Attraction states that what is held in mind reproduces its own kind. Like gravity, it works regardless of awareness or belief. In the case of the orange juice fellow, he altered his and his family’s actions based on his belief that the crooner got a piece of the pie whenever someone bought orange juice. The thought-behind-the-thought is that “by denying Crosby money, I will be better off.” It’s a safe bet that Bing Crosby never lost sleep over the fellow’s refusal to buy orange juice. It would be a reasonable wager, however, that our fellow lost sleep to wealth envy. The loss of sleep, the absence of orange juice, and resentment of those who are doing well didn’t add up to a better life for the fellow. Regardless how much intensity was put into his resentment, prosperity remained elusive. Why? It’s no secret. It is very easy to observe something and witness the contrast. That polarizing aspect rules our universe - there are two approaches to every observation. On the one end is recognizing the desire for joy in life. On the other end is the absence of joy. Law of Attraction will bring together more of what is given attention - more LACK of what is desired, or, more of what is DESIRED. It has nothing what-so-ever to do with what Bing Crosby or any other human being has or does. The orange juice fellow was not denied more wealth, etc., because of Mr. Crosby’s celebrity. But greater good was not allowed in his experience - because he wouldn’t/couldn’t see it. Wealth envy is a product of materialism. This belief is based on a finite material world populated with people (and other life forms) competing for limited resources. Therefore, if someone has plenty, it is at the expense of another, who will have less. Well intentioned egalitarians seek political force to ensure equal outcomes for all. In effect, taking from those who have created wealth and giving to those who have yet to do so. This thinking establishes a collective structure which satisfies the orderly distribution of material resources. One need only examine the behavior of ants. The mounds or subterranean colonies are tributes to orderly design and behavior passed on generation to generation. In fact, the ants and their mannerisms are unchanged for millions of years. They have created a system that guarantees outcome. Is such a state considered progress - unchanged for millions of years? It is if the mannerisms constitute a powerful belief that is unchallenged. The antithesis of such a static universe is a dynamic, ever evolving universe, and an individual as a creative force. In this arena there are unlimited resources since what is observed as material is ever expanding due to the action of some elemental force (dark matter, dark energy, string theory, source energy, spirit, God.) The observed universe is expanding, contrary to cosmologists expectations. In such a belief each person is not bound by material limitations but only by his/her utilization of creative force. This philosophy is more akin to that of the founders of the United States. The unalienable rights are life, liberty and the pursuit of happiness. Unhappy people do not always comprehend why they remain unhappy. Misery loves company (Law of Attraction in action.) Yet it is not necessary to remain static (or stagnant) although one can certainly elect to do so. What to do? Fake it ‘til you make it. In other words, begin thinking as if you are healthy, wealthy, joyful, etc. The thought comes first. A wonderful technique comes from Jerry and Esther Hicks and their inspirational colleagues known as Abraham. It’s called Rampage of Appreciation. The phrase itself has a delicious polarity. Rampage is not a word usually associated with Appreciation. Which is the point. Can a person energetically, single-mindedly, appreciate their moment in life? Absolutely. Such appreciation shifts attention from what is lacking (or unwanted) to something that feels better. When stuck in traffic one could mutter about the heritage of other drivers. Or, one could notice a particularly striking cloud formation. Or examine a car that has features one would like. Or take the moment to tune into favorite music. The point is to remove attention from what is not-wanted and place it on something that is wanted/pleasant. Where the attention goes, so does increase. Imagine how a day in the life of our fellow might have been if the day began with a tasty glass of orange juice and the thoughts about the wonders of the orange tree and how nature devised a barter system to give sweet food to us (and other critters) in exchange for sowing the seeds and making more orange trees. And, the growers who raise the trees, harvest the fruits, and the people who process the fruit into juice and know how to preserve it as frozen concentrate. Oh, and what about those folks who got a grip on expanding gas as a property to cool air - a world without refrigerators? How could that be? And those sturdy truck drivers who ensure the juice reaches its distribution points and finds its way to the very accessible supermarket (in the 1970’s in New Orleans our fellow probably shopped at the huge Schwegmann’s) where the juice is kept frozen until purchased - at a very reasonable price. With appreciation like that over a glass of orange juice, consider what other appreciations lie ahead? Rampage of appreciation. The best treatment I can think of for a bad case of wealth envy.